The interior of the @Xi MTower PCIe workstation offers lots of room for expansion. Photo by David Cohn. Available in single- and dual-processor configurations, the new solution offers enterprise-grade hardware and software. It has been several years since we last reviewed a system from @Xi Computer Corporation. Recently, the California-based company shipped us the latest version of its Xi MTower PCIe. Despite retaining the same name as the system we reviewed several years ago (see DE, February 2015), the workstation we received was all new, from its Fractal Design case to its 8th-generation Intel Core i7 Coffee Lake CPU. The new @Xi MTower PCIe workstation came housed in a large Fractal Design case with a monolithic front panel. Photo by David Cohn. Our evaluation unit came housed in a large Fractal Design Define S black tower measuring 9.17x20.94x19.31-in. (WxDxH). The total system weight was 30.75 lbs. A round power button is centered in the top front edge of the case, with a reset switch, microphone and headphone jacks to its left and a pair of USB 3.0 jacks to the right. The rear two-thirds of the case’s top consists of a ventilation port, below which the radiator for the liquid cooling system is visible, while the monolithic front panel sports only a large @Xi logo—there are no accessible drive bays in the front of the system. The rear panel provides a USB 3.1 Gen2 Type-A port, a USB 3.1 Gen2 Type-C port, a DisplayPort and HDMI port for the integrated Intel CPU-based graphics, a pair of USB 2.0 ports, two additional USB 3.1 ports, RJ-45 jack for the integrated gigabit ethernet, an optical S/PDIF out port and five audio jacks, including line-in/side speaker out, front speaker out, microphone, center/sub-woofer out and rear speaker out. The NVIDIA graphics card in our evaluation unit provided four DisplayPorts. As we have come to expect, however, everything about this workstation is customizable. 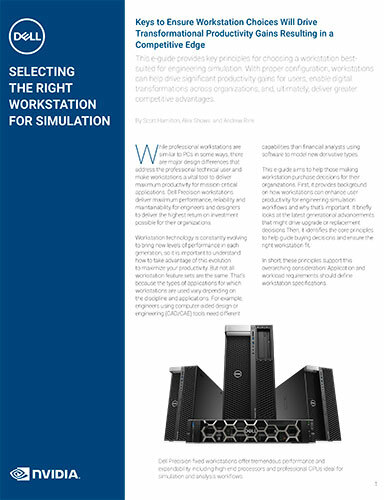 We counted more than three dozen chassis options, including towers, cubes and rack-mount systems. 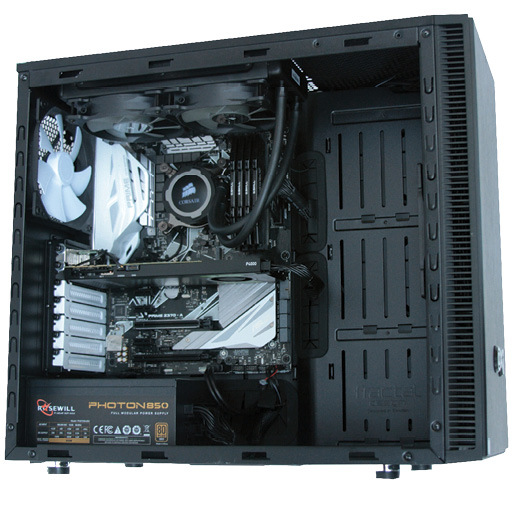 The Fractal Design case with sound dampening materials that housed our evaluation unit added $39 to the base price. Loosening a pair of captive thumb-screws and removing the left side panel of the case revealed an expansive interior. Our evaluation unit was based on an ASUS PRIME ZS370-A motherboard rather than the base configuration’s MSI motherboard. Here again, @Xi offers more than 10 motherboard choices, with the ASUS motherboard in our evaluation unit adding $119. That motherboard has four memory sockets and our system included 32GB of memory installed as four 8GB 3600MHz DDR4 DIMMs, which added $589 to the price. @Xi offers the system with up to 128GB of RAM. @Xi also offers a choice of 14 different Intel CPUs with additional options for over-clocking. Our evaluation unit included an Intel Core i7-8700K. Although that CPU in a standard 3.7Ghz configuration with air cooling would add $249 to the system, the CPU in our unit had all six of its cores over-clocked to 5.0GHz and cooled using a Corsair H105 liquid CPU cooler with dual-fan radiator, an option that increased the system cost by $1,099. (Note that @Xi charges less for slower over-clocking.) The i7-8700K CPU has a 12MB cache, a TDP rating of 95 watts and includes Intel UHD Graphics 630. The motherboard also provides ample expansion, with three PCIe x16 slots and four PCIe x1 slots. Though the base configuration does include a discrete graphics board, @Xi offers a wide range of NVIDIA graphics boards and the system we received came with an NVIDIA Quadro P4000 GPU, which added $759. That high-end GPU has 1,792 compute unified device architecture cores and includes 8GB of dedicated GDDR5 memory. With a 256-bit interface, it delivers a bandwidth of up to 243GB/second. Its 105-watt consumption requires an auxiliary six-pin power connector. The MTower system we received also included an 850-watt Gold Certified 80 Plus Rosewill Photon power supply, which added $95 to the cost. Although the case includes three full-size drive bays, accessed by removing the right side panel, none were used in the system we received. @Xi offers more than 35 different primary hard drive choices, including SATA drives ranging from 1TB to 4TB and solid-state drives (SSDs) from 250GB to 4TB. But rather than the standard 1TB SATA drive included in the base configuration, our system came with a 500GB Samsung 970 EVO M.2 PCIe SSD, adding $199 to the price. If that’s not enough storage, @Xi also offers nearly 50 choices for adding a second hard drive, including drives of up to 10TB. Although our MTower system did not include an optical drive or any other accessories, @Xi again offers lots of options, including more powerful hard drive controllers, RAID arrays, optical drives, VR headsets, sound cards, external speakers, networking options and more. With its over-clocked six-core CPU and high-end NVIDIA graphics board, we expected the new Xi MTower PCIe workstation to perform very well, and it definitely lived up to those expectations. On the SPECviewperf benchmark, only systems equipped with the more powerful NVIDIA Quadro P5000 GPU did better, and the @Xi system even beat those workstations on one of the Viewperf datasets. 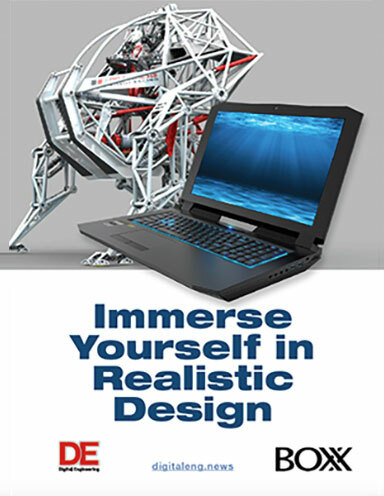 On the SPECapc SOLIDWORKS benchmark, the @Xi workstation also scored near the top on every aspect of this test, and again turned in the best score we’ve ever recorded on one portion of the test. And on our AutoCAD rendering test, which clearly shows the advantage of fast CPUs with multiple cores, the Xi MTower PCIe workstation averaged just 24 seconds to complete our test rendering, nearly 5 seconds faster than any other workstation we have received. We also ran the demanding SPECwpc workstation performance benchmarks. Here again, the Xi MTower PCIe performed extremely well, delivering results consistently near the top of the field and again recording the top scores in several of the individual test components. Despite a total of six fans (front and rear case fans, two radiator fans, plus fans in the GPU and power supply), the system remained nearly silent throughout most of our testing. But heavy compute loads during some tests caused sound levels to reach 73dB. @Xi pre-loaded Windows 10 Professional 64-bit, a $59 upgrade from the copy of Windows 10 Home supplied as part of the base configuration. Our system also included a 104-key Logitech MK120 USB keyboard and USB mouse, but again, @Xi offers lots of other input options. Like many other system integrators, the standard warranty only covers system parts for one year, although @Xi does include three years of coverage for labor and lifetime tech support. Longer warranties of up to five years are available for an additional cost. Once we tallied up all the high-end components, our evaluation unit priced out at $3,957 ($4,056 after adding $99 to reflect a full three-year parts warranty). Although that price represents a significant markup compared to the cost to build a similar system, it’s possible to fall short of the extreme CPU over-clocking achieved by the folks at @Xi. When considering the fact that it matched and, in some cases, outperformed other over-clocked workstations costing considerably more, this new Xi MTower PCIe workstation delivers a great price/performance proposition.